On Feb. 7, 2019, the Moderate Resolution Imaging Spectroradiometer, or MODIS, instrument aboard NASA's Terra satellite captured a visible image of Tropical Cyclone Gelena. The visible-light image showed bands of thunderstorms wrapping into what the Joint Typhoon Warning Center called "an intermittent eye feature." 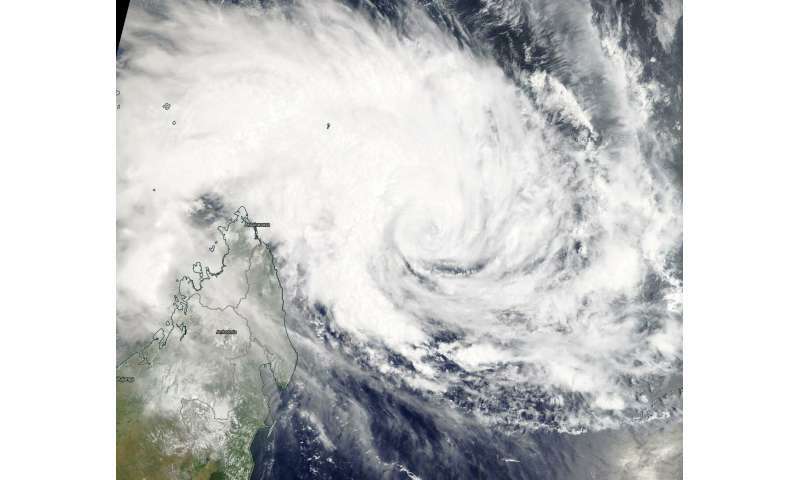 The western quadrant had the bulk of clouds and thunderstorms that extended to the northern tip of Madagascar. Forecasters at the Joint Typhoon Warning Center expect Gelena to strengthen rapidly while moving southeast. Gelena is forecast to move away from Madagascar over the next several days, but will pass close enough to Mauritius for the island to feel the tropical cyclone's effects.